Surul Appam - Rolled Sweet Appam, this is one of the easy to make sweet recipe which my mom used to make when I go to school. She will make this for evening snack. I have almost forgot this recipe for sometime. When I visited my mom last time, she made this tasty sweet for me and my kids. My kids enjoyed it very much. Few people add food color to the roll, but she will make it without adding any color. So, if you want it to be more attractive for your kids, you can add a pinch of any food color to the roll batter. 1. 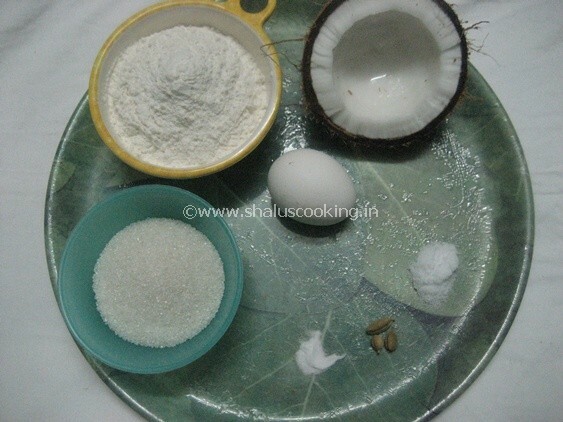 Keep all the ingredients ready for making Surul Appam / Rolled Sweet Appam. 2. Whisk / Beat the egg in a bowl. Add the Maida / All purpose flour, salt, cooking soda and a tablespoon of sugar. 3. Beat it nicely to make a thick paste without any lumps. Pour water little by little and mix it to make a dosa batter consistency. Let it set for about 15 minutes. In the meantime add cardamom powder, remaining sugar to the grated coconut and mix well. 4. Grease dosa tawa with little ghee. Take a ladle full of batter and spread on the tawa to make small dosa. Allow it to cook on both sides. 5. Once it is cooked on both sides, place the coconut stuffing in the middle of the dosa and roll it as shown in the picture below. Easy and tasty Surul Appam - Rolled Sweet Appam is ready to serve.